Moog Minitmoog preset synthesizer advertisement from page 29 of Contemporary Keyboard Magazine September/October 1976. This advertisement seems to have run only a handful of times in CK towards the later half of 1976. 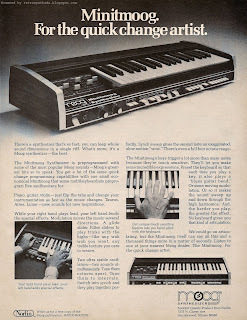 And, if references on the Web are accurate, the Minitmoog itself is almost as rare as this ad - apparently only 2500 or so Minitmoogs were made during its brief 1975-1976 life span. Moog's ads in CK were very recognizable during this time period, and this Minitmoog ad followed the template to a 'T'. Like Moog's 1976 Micromoog and Polymoog ads, it starts with the name of the instrument and the tag line both in that comfortingly familiar font. Underneath is the feature photo, followed by text-heavy ad-copy with smaller photos peppered throughout. Even the ad-copy between these ads were similar in the sense that they hit home the same two or three key messages (whether on purpose or not). These key messages really give us a glimpse into the problems synthesizer musicians were facing at the time, and more importantly, how Moog was helping them solve these problems. This Minitmoog ad hits on all three key messages - expressiveness through its modulation features and touch sensitivity, the 'ultra stable oscillators', and the ease of programming through presets. If you read through the '76 Micromoog ad you will see the same key messages in the ad copy - lines such as 'freedom of expression', 'pitch drift is a thing of the past' and 'easy to buy, easy to play'. Key messages aside, I like these Moog ads for one other reason. Next to the Norlin logo is the text "write us for a free copy of the Moog publication, IMOOGINATION". Moog placed an Imoogination advertisement in earlier issues of CK, and kept the promos running throughout the Moog advertisements that followed. Check out my Imoogination blog post for some more information on the publication. End note: While doing some online research I came across Don Tillman's Web site. He has a page devoted to Moog patents, including this one for the Minitmoog and Satellite preset synthesizers. "I think it is interesting how the guts of some great synthesizer circuitry is described so well in patents, yet not covered in books or articles to any great extent. Sure, patents are the way to protect this sort of intellectual property in a business with some competition, but these patents speak volumes about the approaches the engineers were taking in creating some breakthrough musical instruments. At the very least the patents, as well as other synthesizer patents, supply remarkable lessons in not only how to design analog circuitry, but also in how to build a great musical instrument." I've never actually taken the time to look at a synthesizer patent - and it was quite interesting to read one (PDF). If that link doesn't work, go to Don's Moog patent content for the Minitmoog, click on the pat2pdf.org link, and type in the patent number (if required). Up comes the PDF. Neato. I think I might spend a lot of time here.